Chelsea host Arsenal in the Premier League's early kick-off on Saturday afternoon, as the Blues look to improve on what has been a wretched start to the campaign. Both sides played midweek Champions League football, and that affected their selections. So, let's take a look at how this game could play out from a tactical perspective. Jose Mourinho rested around six key players for the home visit of Maccabi Tel-Aviv midweek, and despite some impressive performances (notably Ruben-Loftus Cheek and Baba Rahman) during the 4-0 obliteration, it was expected he'd make a sea of changes again. He did just that. Chelsea XI: Begovic; Ivanovic, Zouma, Cahill, Azpilicueta; Fabregas, Matic; Pedro, Oscar, Hazard; Diego Costa. 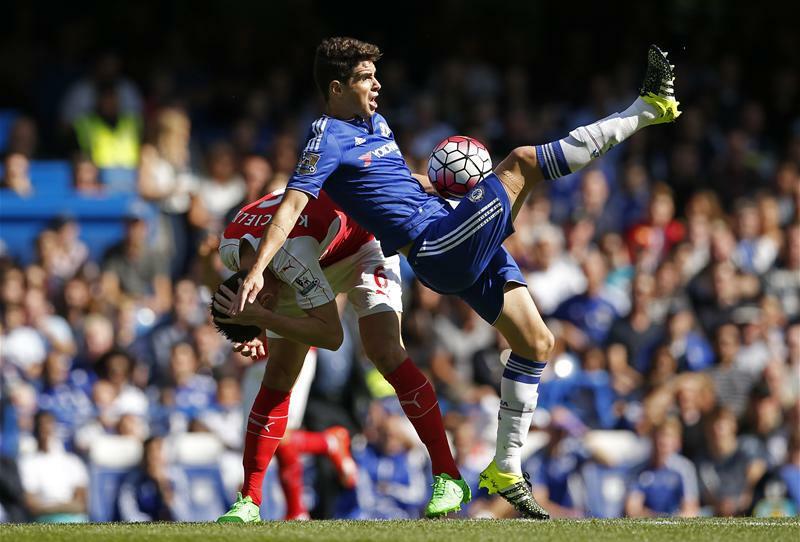 Chelsea will be confident of finding success in central areas against the Gunners. Mourinho and his men can exploit Santi Cazorla's adventurous tendencies and defensive disassociation in Arsenal's dual-pivot. If Chelsea can maintain a swift tempo and work the ball wide before switching it back, they will find extra space in the middle for attacking midfielders to expose. This may well provide an avenue of success for former Gunners player Cesc Fabregas on Saturday. By the same token, Arsenal's possession game relies heavily on Cazorla moving his side around the field. If Fabregas can get close to his Spanish compatriot, the illustrious visitors will struggle for fluency. For Chelsea, John Obi Mikel might be asked to carry out his customary defensive role again if Mourinho feels apprehensive, while any of Cesc Fabregas, Oscar or Ramires could occupy space as creators or distributors. In this exact fixture last season, Stamford Bridge the destination—the midfield trio of Wilshere, Flamini and Cazorla were completely outmaneuvered by Chelsea's technically superior and more mobile players. I'd imagine Wenger won't let that happen again. Chelsea were comfortable in allowing Arsenal plenty of possession in that aforementioned fixture but picked off their opponents on the counter-attack at will. This was something that almost proved fruitful at the Emirates last season, too, as Chelsea countered and Fabregas scooped the ball over for Oscar, before he was flattered by David Ospina in what looked a blatant penalty shout. Mourinho is likely to opt for a similar philosophy as he did against Wenger's side in both fixtures last campaign, allowing Arsenal possession but visibly compact and seeking to release Hazard, Oscar and Pedro on the counter-attack, especially when the visitors' full-backs are caught high up the pitch. Will Mourinho set out his side like that today? Arsene Wenger was also able to rest key players midweek, but he'll be furious of his side's tepid display in Russia against Dinamo Zagreb. For the third consecutive week, there have been more negatives than positives to speak of. Arsenal XI: Cech; Bellerin, Koscielny, Gabriel, Monreal; Cazorla, Coquelin; Ramsey, Ozil, Sanchez; Walcott. Eden Hazard hasn't been himself lately. OK, so even the most consistent players have off weeks, but his last handful of performances have been far from cogent for a few reasons. Firstly, he was shackled by Seamus Coleman in Chelsea's third defeat of the campaign against Everton, and the industrious Irishman proved a man-marking strategy of sorts can seriously halt his dominance. Hazard was really ineffective out on that right flank. Second, midweek against Maccabi, he looked a little disinterested and, perhaps, even lazy. While Oscar ached for every tackle, laboured and laboured and scored his side's second goal, Hazard lofted about and skied a penalty early on. In order to shut out Hazard, Arsenal need to set up to play without the ball, focusing on limiting service from Chelsea's midfield into attack. When he's in possession, Arsenal must restrict the space he likes to operate in. That'll mean an approach 4-2-3-1 of sorts but dropping into two clear, deep banks of four off the ball, squeezing Hazard and Co. into slim gaps and preventing them from turning in space. He has caused the Gunners' full-backs great trouble in the past—at times, the Belgian has played as a typical winger just to exploit the defensive weaknesses of his full-back opponent. Matic, arguably the world's best defensive midfielder at times, is a nightmare to play against due to his graceful mopping up of attacks and eloquent starting of new ones. He can transition Chelsea from attack to defence in seconds. But sides have shown he can be pulled around if the player taking on him on has enough core agility and space to work in—in addition to cojones to actually try it on. If Harry Kane and Steven Naismith can do it, so can Ozil. Ozil will work from the hybrid No.10 role as usual, and will often receive the ball with the chance to turn and dribble at Matic. He also needs to encourage his midfield duo of Francis Coquelin and Santi Cazorla to be brave enough to try to pass through Chelsea's double-pivot and find Ozil in between the lines. He has the quick decision-making process and quick feet to turn and distribute, opening up so much for Arsenal in the attacking third. He has the tendency to disappear in bigger games, but if the ball can be shifted quickly enough, and Walcott can make space for Sanchez, there are goals in this game for the Gunners. It will be an intriguing tactical encounter in West London and one that will go some way to predicting the rest of the season for both sides.